The Golf Cart Mount attaches the laser rangefinder to your golf cart for esy access. Quick release clamp attaches to golf cart and can be removed easily after 18. 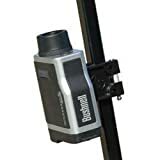 Bushnell Laser Rangefinder Golf Cart Mount (UPC 029757203168) is sold at the following online stores. We've find the latest prices so you can compare prices and save money when making your purchases online. Please click on the links below to browse to each store's webpage.